Epsilon’s Secure Application Virtualized Environment (SAVE) provides a smarter approach to cloud computing by adding customer site High Availability (HA) to our hosted infrastructure offering. 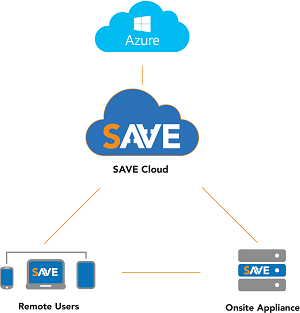 SAVE includes an onsite appliance to provide secure accessibility to data in the event of an internet outage, resolving a common bottleneck in most cloud solutions. This ensures that no matter the conditions – offline or online, at the office, or away, SAVE improves the survivability of an organization by giving it accessibility to critical resources both onsite and in the cloud. Plus, we can easily integrate with your other cloud services, making authentication and security across your platforms a reality.